Our Cookbook Signing at Anthropologie! You're invited: Thursday March 31st in Austin. Mark your calendars, you’re invited to our cookbook launch event next week! If you live in Austin (or you’re going to be in Austin), I’d LOVE to see you!! 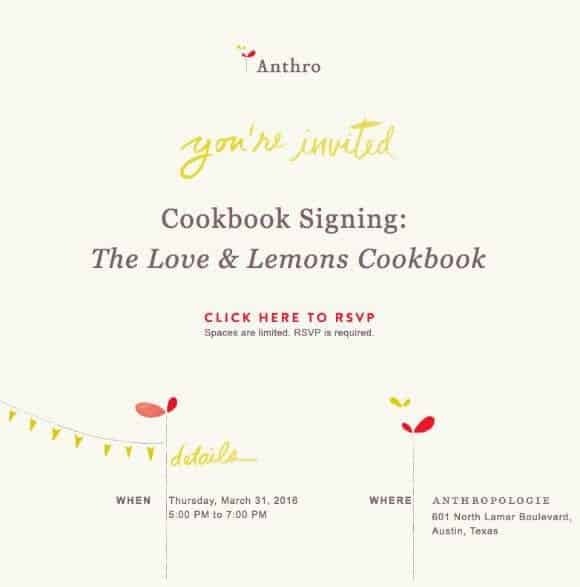 We’ll be at Anthropologie at 6th and Lamar on Thursday March 31st from 5-7pm. There will be sparkly cocktails and snacks inspired by recipes from the book. Come meet us!! The event is free – just click over to RSVP. Ahh, I’d love to come to this. Won’t be coming to the Austin area until this summer. Shame it wasn’t last week , my partner was in Austin for SXSW . Congratulations for your book !!! I have a totally out of subject question. Im from France and I will Côme in austin this summer. And Im vegan. Do you have great place to suggest to me please ? I will be in corpus christi too…. Hi Elodie, check out: Bouldin Creek Cafe, The Steeping Room, Lick Ice Cream (they have a few yummy vegan flavors), Sweet Ritual (all vegan ice cream), the downtown Whole Foods, and True Food Kitchen. Hope that helps! (I’ve never been to Corpus Christi so I don’t have suggestions there). I just bought your cookbook randomly at Anthropologie (in Boulder) this week and I’m in love! It’s inspired me to cook much less meat and more veggies and fruit. I hosted a small dinner party last night using a few of your recipes (blackberry basil bruschetta and elotes & roasted chickpea tacos along with my own vegetable soup- I know, they don’t really go together..) and it was a definite success! Thank you. Also question- I made some guacamole, hummus, and pesto yesterday but I had a little trouble. I tried using a magic bullet but it didn’t do too well with the hummus or pesto. I also tried the pesto in my vitamix, but there just wasn’t enough of it to really work. Do you have any recommendations for small food processors that do well with hummus and pesto? Hi Auri, I’m glad you like the book! For guacamole, I mash it with the back of a fork, no food processor or blender necessary.